Big Nick - the Ruler of the Rucks. One of the truly great players in the history of VFL/AFL football, and the man widely regarded as the finest ruckman ever to play the game, John Nicholls led the Carlton Football Club to two Premierships as captain, and a third as captain-coach, in a celebrated playing career spanning 18 seasons. ‘Big Nick’ was a skilful and inspirational on-field leader, as well as a fierce protector of his team-mates. He played his first senior match before his eighteenth birthday, and was retired – against his will - by the Carlton committee just 17 days before he turned thirty-five. In between, his career was packed with glory, controversy, heart-break, and just about every individual and team honour the game could provide. It all began for John Nicholls in 1956, when Carlton won a tussle with Geelong to recruit his older brother; Don. The Nicholls boys hailed from Maryborough in central Victoria, where Don was a star centreman, and his bigger, barrel-chested brother was already playing senior football at the age of fifteen. Don Nicholls adapted quickly to life in Melbourne, and to VFL football. Fifteen solid games in his debut season won him Carlton’s Best First-Year Player Award, and focussed attention from a number of other clubs on his 17-year old sibling. In the summer of that year, John joined Don in Melbourne, where he eventually gave in to the urgings Carlton captain Ken Hands, and agreed to play for the Old Dark Navy Blues. By his own admission, at first Big John was not particularly confident of his ability to play at elite level. But under the encouragement and inspiration of Hands, he was a quick learner. In 1957 he emulated Don by also collecting the Blues’ Best First-Year Player trophy - the first of many honours as he quickly developed into one of the game’s most powerful and skilful ruckmen. Although not overly tall at 189 cm, he was a solid 105 kg at his peak, with huge, tree-trunk legs and brawny arms. He wasn’t particularly quick across the ground, but he was an intelligent reader of the play, a strong mark, and an accurate deliverer of the ball by hand or foot. When resting forward he was a reliable kick for goal inside 50 metres. He jumped high for a man of his bulk, and was an exceptional palmer of the ball at boundary throw-ins or centre bounces. As his career progressed, he became the master of one-on-one duels, because of his ability to quickly assess his opponent’s strengths and weaknesses. Although he preferred to palm the ball with his left hand, he was almost impossible to counter. He attacked the ball from any angle, using his right arm to fend off his opponent, while turning his body to direct the ball with his left. By 1961, Nicholls was firmly established among the games’ elite. Carlton’s Best and Fairest in 1959, he had already twice worn the Big Vee in interstate matches. Rival coaches planned long and hard to limit his influence, and frustrated opponents sometimes resorted to mindless aggression against him. One such incident occurred at Princes Park in August 1961, while Carlton was busy thrashing South Melbourne. Earlier that year, Swans ruckman Ken Boyd had been suspended for eight matches when he was found guilty of striking Nicholls - and Blues rover John Heathcote - during a spiteful round four game at the Lake Oval. Nicholls vehemently denied Boyd’s accusations, saying that he never used his legs or knees in general ruck play or at centre bounces for anything else but protection. Amidst claim and counter-claim, the VFL stepped in, and, armed with Boyd’s very public confession, suspended him again – this time for 12 matches. Boyd’s tempestuous career ended right there. He had played 60 league matches, and missed another 30 through suspension. The following season of 1962 brought a huge personal challenge for Nicholls, with the arrival at Geelong of champion West Australian follower Graham ‘Polly’ Farmer. Raised in an orphanage, Farmer had battled adversity with a keen football brain and outrageous talent to build a brilliant career. Almost from the day he arrived in Victoria, the dual Sandover Medallist began single-handedly changing the game with his revolutionary approach to ruck play.. Instead of palming the ball, Farmer preferred to take possession, before firing out a deadly-accurate thirty-metre handpass to a running team-mate. Nicholls countered by denying Farmer space on his preferred left side; leaning on, or into the Big Cat to get to the ball first. Although Farmer was already 27 by the time he joined Geelong, football fans were treated to five seasons of legendary confrontations between these two champions, in a fondly-remembered time of far less-regimented ruck rules. From 1964 to 1971, Nicholls, ruck-rover Sergio Silvagni and rover Adrian Gallagher formed perhaps the finest first ruck combination of all time. So good in fact, that all three were later honoured by inclusion in Carlton’s Team of the Century. But 1957 to 1967 was a period of little success for the Blues, which goes some way to explaining why, in 1965, Nicholls accepted a lucrative offer to captain-coach NSW country club Turvey Park. It just so happened, however, that Nick’s decision to leave Princes Park for greener pastures coincided with the dawn of the George Harris -Ron Barassi era at Carlton, and neither man would have a bar of their ruck trump leaving. President Harris insisted that Nicholls’ contract was re-negotiated, Turvey Park Football Club was quickly compensated with a couple of fringe players, and new coach Barassi was then able to get down to the task of lifting the struggling Blues back into flag contention. That Barassi was able to do so was in no small way due to the consistency of his ruck division of Nicholls, Silvagni and Gallagher. Boosted by a revitalised administration and driven by Barassi, Carlton’s 27-year Premiership drought ended at last in 1968, when the Blues edged out Essendon for a 3-point Grand Final victory. Playing his 200th senior match in his twelfth season, Carlton’s inspirational captain controlled the ruck all match, and willed his team to victory in a torrid final term. Two years later came Ron Barassi’s finest hour. With Carlton trailing Collingwood by seven goals at half time in the 1970 Grand Final, he somehow convinced his team that the game could still be won. He demanded that the Blues run hard into any available space in the second half, and that they handpass at every opportunity to unsettle their opponents. The ploy worked superbly. Carlton, led by Nicholls, stormed back into the match, and eventually won the greatest Grand Final victory of all by ten points. Shortly after Big Nick had paraded that Premiership Cup around a packed MCG for the second time in three seasons, and Barassi was re-appointed for another three years, the committee of the Essendon Football Club made a determined bid to lure Nicholls to Windy Hill as playing coach of the Bombers. Nicholls was sorely tempted (and eventually gave his in-principle agreement) because he believed that Barassi would be at Princes Park forever. But when the story was leaked to the newspapers of the day, a storm broke and Essendon were forced to withdraw. By 1971, John Nicholls could look back on an unbroken run of ten seasons as a player, captain or captain-coach of the Victorian state team. He had won Carlton’s Best & Fairest four times, captained two Premiership teams, and finished runner-up in the 1966 Brownlow Medal. So when Ron Barassi surprised by revealing that his time as coach of the Blues was up, Big Nick was immediately handed the opportunity he had always wanted; to captain-coach his beloved Blues. Carlton’s third flag in six seasons, the record-breaking Premiership victory in 1972, was perhaps Big Nick’s crowning achievement. Discounted in some quarters of the football press for being past his best at the age of 33, he led his team into the Grand Final against the confident Tigers as rank underdogs. However, Carlton jumped Richmond from the opening bounce, and scored an emphatic five-goal victory. Nicholls himself kicked six goals from a forward pocket, and the Blues’ huge winning score of 28.9 (177) remains a Grand Final record. Big Nick’s last appearance on VFL Grand Final day came in 1973, when Carlton and Richmond faced off for a second straight season. Still smarting from their defeat 12 months before, the Tigers were burning for revenge and hell-bent on intimidation. The Blues knew what was coming, and were prepared to fight fire with fire, but in just the third minute, Nicholls juggled an overhead mark in Carlton’s forward pocket and left himself wide open. Charging in from the opposite direction, Richmond defender Laurie Fowler seized his chance, and crashed Nicholls to the ground with a sledgehammer-like shirt-front. Nicholls was knocked senseless for some time, and though he regained his feet and stayed on the ground, he was a virtual passenger from that point on. That incident inspired Richmond, and they went on to beat the Blues by five goals. It took Big Nick a long time to get over the devastation of that loss. By the mid-point of 1974, he had decided that his playing career would wind up with Carlton’s last game of that season – especially because the Blues were seemingly destined to miss the finals. But before he was able to make his intentions clear, the decision was taken out of his hands. On the Tuesday night following the Blues’ round 17 loss to South Melbourne at the Lake Oval on Saturday, July 27, club President George Harris told Nicholls that the committee had decided that his playing career was over. He was, however, expected to continue as coach. Nicholls eventually accepted the situation – although it did nothing to heal the deepening rift between himself, Harris, and some members of the club committee. He steered Carlton into the finals yet again in 1975 - losing both games by narrow margins - then stunned the club by resigning only days before the first match of 1976. Later, he briefly coached South Australian club Glenelg, and Coburg in the VFA. Although the circumstances of Big Nick’s departure from the playing field were far from ideal, and some of the scars inflicted took a long time to heal, there is no doubt that in the years since he wore his famous number 2 sleeveless guernsey for the last time, his stature and standing at the Carlton Football Club has not for one moment diminished. By any criteria, his career record is simply outstanding. In his then VFL-record 331^ games, he was a proud member of three Carlton Premiership teams; in 1968, 1970 and 1972. Captain of the club in 1963, 1969, 1970 and 1971, he was captain-coach in 1972, 1973 and 1974. He won our Best & Fairest award a club record five times (in 1959, 1963, 1965, 1966 and 1967) and was a Victorian state representative on no fewer than 31 occasions. No other player in the history of the game has worn the big white vee so consistently, and with such distinction. In September 1996, Big Nick was inducted into the AFL Hall of Fame as one of the inaugural Legends of the Game. At the same time, was one of six Carlton greats selected in the AFL's Team of the 20th Century. When Carlton Football Club announced our Team of the Century in May, 2000 he was the obvious and unanimous choice to lead the ruck, and from 2004, the Blues' Best & Fairest player of each year has been awarded the John Nicholls Medal. Furthermore, in June 2014, during celebrations marking Carlton's 150th year of VFL/AFL competition, John Nicholls was officially recognised as the Blues' greatest player of that time, edging out Stephen Kernahan, Bruce Doull, Alex Jesaulenko and Stephen Silvagni. John Nicholls’ father Charlie was one of four brothers; Charles, Alex, Percy and Roy, all of whom were prominent players for the Castlemaine Magpies during the 1920s. 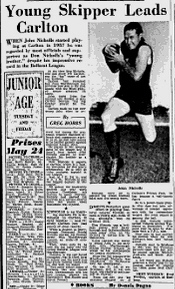 Charlie Nicholls was the Bendigo Football League’s top goal-kicker in 1925 with 58 majors, and all the Nicholls boys were part of Castlemaine’s first BFL Premiership team in 1926. The Argus (June 06 p6) reported on the Golden Point - Maryborough game on June 04 which ended in a draw. The two teams had met the previous month and that too had been a drawn game. Both John and his brother Don Nicholls were playing for Maryborough. Don named was named at full back, with John along side in the back pocket-resting ruck position. "John Nicholls, a 15 year old student at Maryborough Technical School. 6ft. 2 in, and weighing 13 and a half stone, played a man-sized game in the ruck." NB# Nicholls played 328 games, but is often credited with 331 - made up of 328 Carlton senior games, and 3 state matches when he represented Victoria while Carlton was also playing on the same day. Those three occasions were against Western Australia on July 17, 1971, and in the 1972 Carnival against Tasmania and South Australia. Contributors to this page: Jarusa , PatsFitztrick , blueycarlton , pblue , molsey , Bombasheldon , true_blue24 , WillowBlue and admin . Page last modified on Monday 15 of May, 2017 11:52:23 AEST by Jarusa.